A dermatologist explains how to tackle the stubborn spots. As a long-time sufferer of blackheads, trust me when I say, I know how annoying they can be. So I spoke to dermatologist Dr. Anjali Mahto from London's Cadogan Clinic to find out once and for all how to get rid of those pesky little black dots. You can't tackle the problem until you understand the cause, right? So let's go back to basics. Why do we get blackheads? "We all have pores and when those pores become blocked with debris, oil, or dead skin cells, that's when you get a blackhead. The reason they look black is because all the oils in them become oxidized. It's not the dirt that is black, it is just oxidized oil," Dr. Anjali Mahto explains. How are they different to whiteheads? "When it comes to blackheads, the pore remains open, whereas when you get a white head the pore has become blocked over—and then you get a little pustule." Niiice, huh? Recognize that it's an ongoing problem. 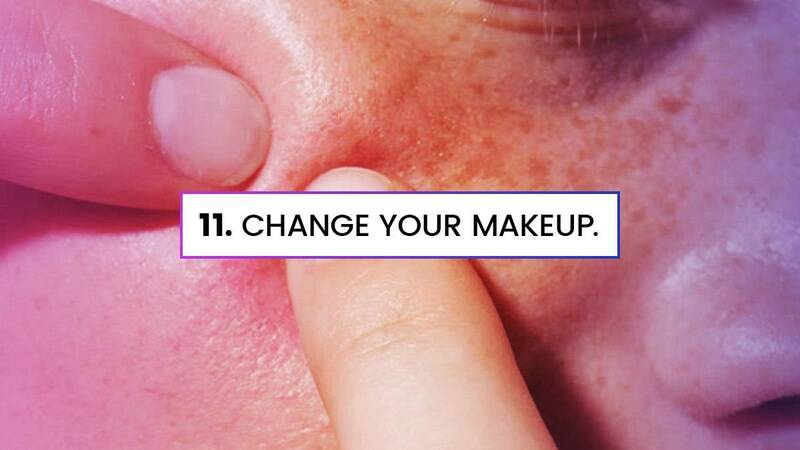 "There are loads of ways you can get rid of blackheads. However, the underlying problem is the excess oil that is being produced," says Dr. Mahto. "So whatever treatments you do, blackheads will always naturally reform every 20 to 40 days." Annoying, we know. "This means doing a one-off treatment won't permanently get rid of them, the blackheads will come back. Tackling them needs to be an ongoing process." The first step is the simplest: try an exfoliator to remove the "upper layer of dead skin cells. So you're effectively preventing everything from...getting blocked inside that top layer of pores," says Dr. Mahto. "In terms of exfoliation, there are two ways you can do it: mechanical exfoliation and chemical exfoliation. Mechanical is physically using something abrasive on the skin, so either a face cleansing brush which rubs the surface of the skin, or something like a face scrub with granules in it to buff away that top layer." "Be careful not to over-exfoliate though, as that can push the inflammation deeper and worsen the spots, whilst also causing dryness and irritations. If you are exfoliating acne or oily-prone skin, once a week is fine." You can use chemicals like glycolic acid, salicylic acid, or chemical peels to dissolve the upper layer of dead skin cells, according to Dr. Mahto. "AHAs (alpha hydroxy acids) are really good for treating blackheads, so they are basically your glycolic acids and your lactic acids. Then you have your BHAs (beta hydroxy acids), like salicylic acid, they cause a chemical disintegration of the top layer of the skin cells, so they dissolve everything, and that unblocks the pores." "If you have acne or blemish-prone skin, using a clay mask once a week can be really beneficial. They're super effective when it comes to drawing impurities out of the skin and reducing oil production," says Dr. Mahto. "Exfoliate before applying the mask, as this will allow it to really penetrate the skin." If you're trying to decongest your skin, "look out for non-comedogenic products (aka, products that won't clog your pores). I don't like to use oils or oil cleansers on acne-prone skin. Coconut oil, for example, is highly comedogenic so I'd avoid it if you're prone to breakouts and blackheads." Avoid: "Pay attention to textures. You don't need thick, heavy creams, and I would avoid ingredients like petroleum, shea butter, and glycerin, essentially any ingredient designed to be really moisturizing to the skin as they'll also clog the pores." Try: "Instead, look out for lightweight gel formulas and ingredients such as salicylic, benzoyl peroxide, witch hazel, and niacinamide." Set an appoint for an extraction facial. If you've tried all that and you're still getting blackheads, it's worth setting up an appointment to have an expert give you an extraction facial. "An aesthetician will steam your skin to loosen the oil in your pores. They will then use a blackhead extractor tool, or they will physically squeeze them out," says Dr. Mahto. "This is one of those things that should not be done at home. It needs to be done by someone who is trained to properly extract them, otherwise, you could push the inflammation deeper and cause spots and scarring." Go for a chemical peel. The next thing to try? A medical-grade chemical peel. "A professional chemical peel will involve a medical-grade glycolic acid or lactic acid, that will be used on the skin to dissolve the dead cells and unclog pores. Again though, it's important to remember that blackheads do reform, so these treatments need to be done every four to six weeks. Chances are, you've probably heard a fair bit about retinol/retinoids. They aren't exactly new to the skincare world, but despite being around for a few years they're still considered one of the best methods when it comes to tackling skin imperfections. "Retinoids are great if you have blackhead-type acne or a predisposition to blackheads," says Dr. Mahto. "Retinoids are vitamin A-based formulas and they cause an accelerated exfoliation. You have to be patient though, as they take about 12 weeks to kick in." "It's important to use them with care [because] retinoids can be quite strong, and should only be used at nighttime because sunlight will inactivate them," explains Dr. Mahto. "If you've never used them before, gradually build up the strength. Start off slowly, using it once or twice a week. If you're not too red or itchy, build it up to every night. Then once you're okay with that percentage, you can move up to a stronger dose." "If all else fails it might be worth speaking to your dermatologist about tablet treatments for acne," says Dr. Mahto. "In many cases, blackheads are one of the initial signs of acne, so people will have blackheads before they develop any other spots. This means that tablet treatments used for targeting acne, like the pill, antibiotics, or prescription creams, will help with blackheads." Yes, when it comes to covering blackheads it can be tempting to reach for that high-coverage concealer, but don't. A lot of makeup formulas can clog pores and aggravate acne-prone skin. "I'd recommend opting for a lighter base or one with salicylic acid in it, which as I mentioned earlier, helps to target blackheads."